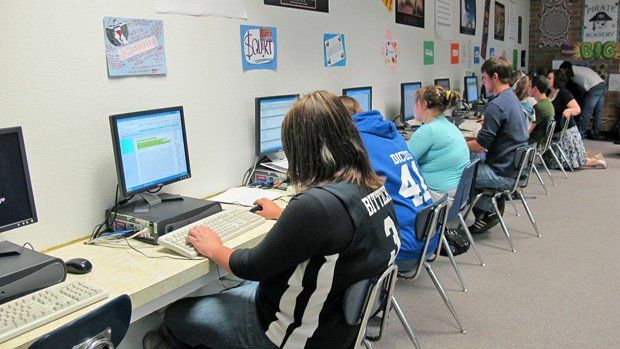 Multipurpose Room: A computer lab at the back of a regular classroom serves as the online-learning center at Notus Junior/Senior High School in rural southwest Idaho. Online learning is a strategy aimed at closing achievement gaps, improving student achievement, increasing graduation rates, and expanding the availability of high-quality teachers to all students, regardless of distance and location. The primary reason school districts offer online courses is to expand what they can offer their students and provide them with classes that would otherwise be unavailable. It is also an effective strategy for personalizing the learning process to meet individual student needs. Students who have failed in the traditional classroom setting can benefit greatly from credit-recovery programs implemented online. In addition, programs that use online courses can assist students who move regularly from one school to another in a district. Finally, online learning can provide a solution to teaching shortages and can increase student access to college-prep curricula. Today, 45 of 50 states and the District of Columbia have a state virtual school or online initiative, full-time online school, or both, according to "Keeping Pace with K-12 Online Learning," ( 3M) a 2009 report sponsored by ten schools and organizations across the country. K-12 online learning grew from 50,000 enrollments in 2000 to an estimated one million-plus enrollments in 2009. Overall, online learning is growing at the rapid rate of 30 percent annually, report John Watson and Butch Gemin in their 2008 paper "Promising Practices in Online Learning." ( 630K) And according to a Sloan Consortium survey, 75 percent of school districts offer online or blended courses. Options for K-12 online education include full-time virtual schools (often state-sponsored charter schools), part-time online courses (offered through a state or district-led initiative), and blended environments, according to "Keeping Pace." In my own address to the Society for Information Technology and Teacher Education this year, I reported that K-12 online education options continue to expand, with students participating in site-based online labs, hybrid courses, and part- and full-time virtual options that are offered by a variety of providers including charter schools, districts, state supplemental programs, corporations, and colleges. It should be noted that these conclusions were drawn from research mainly conducted in career- and higher-education environments. There is still very little empirically validated evidence available for K-12 online-learning environments outside of individual case studies. A 2001 meta-analysis ( 180K) in the International Journal of Educational Telecommunications looked at the range of distance-learning technology used at the K-12 level and found that student achievement in distance-learning programs and classroom programs was equivalent. The online programs that enhanced classroom learning and used short-duration lessons and small groups showed greater effect sizes than videoconferencing programs and other methods. Researchers Mickey Shachar and Yoram Neumann, writing in 2003 in the International Review of Research in Open and Distance Learning, found a significant positive effect for K-adult distance-education programs, noting that "in two thirds of the cases, students taking courses by distance education outperformed their student counterparts enrolled in traditionally instructed courses." A meta-analysis of 232 studies of online and audio- and video-based learning in K-12 and postsecondary students, published in 2004 in the Review of Educational Research, showed a small positive-effect size for achievement in online learning compared to classroom-based instruction, although online learners had slightly lower retention rates. A meta-analysis that focused solely on the K-12 online-learning delivery systems in use in today's virtual schools, "The Effects of Distance Education on K-12 Student Outcomes," ( 630K) was funded by the U.S. Department of Education and published in 2004. It found, once more, that achievement in online programs was approximately equivalent to achievement in classroom programs. Current K-12 virtual teachers are very experienced teachers, with 73 percent reporting six or more years of teaching experience (live and online). Some online teachers had very limited training to meet short-term needs (22 percent had 10 hours or less of training), while others had more opportunities and resources and, consequently, had more transformational forms of training (46 percent had 45 or more hours of professional development). This approach to professional development can create inconsistencies across programs and schools and can therefore affect teacher quality, student and parent satisfaction, and learning outcomes. By way of comparison in the international arena, Singapore trains every preservice teacher to teach online, including training in blended-learning models for the classroom. Additionally, 100 percent of secondary schools there use online learning. In Mexico, every new teacher is trained to use digital curricula. And in China, online teacher training is expanding to meet the 2020 goal of reaching 100 million more students in grades K-12. Lisa Dawley is professor and chair of the Department of Educational Technology at Boise State University. This article is adapted from "Redefining Teacher Education: K-12 Online-Blended Learning and Virtual Schools" ( 120K) by Susan Patrick and Lisa Dawley, a brief prepared for the Summit on Redefining Teacher Education, which was held at the University of Texas at Austin.